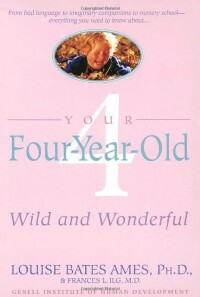 First, the book was written in 1976 and your child will be referred to as either "Four" or "him" throughout. An occasional paragraph is written specifically about girls, but aside from those, your child is a "he". I found this distancing (my four-year-old is female) and a bit confusing, because sometimes the prose switches from using "he" to mean all children to using "he" to refer only to male children, and it's hard to keep track of who is being referred to sometimes. Although, if you don't concentrate on the details, it's pretty easy to figure out, because apparently boys are adventurous, aggressive, and athletic, and girls are, well, not mentioned that often so I guess they're just not like boys! This is why we don't read parenting books written in 1976 anymore.Other than the rampant sexism, this book seems to be written to reassure parents that all the normal things their child does are normal. For example:Dressing up is very big at Four. Boys as well as girls love to dress up, preferably in adult clothes. Boys, as a rule, prefer cowboy hats and holsters; girls love long gowns, veils, hats, handbags. Boys are less likely than earlier to dress up in high-heeled shoes or women's hats. Make-believe weddings, with the bride, especially, dressed elaborately from the old-clothes box, are popular.Duh. Congratulations, your child is successfully incorporating societal gender norms into his or her identity? Yay for gender programming? No comments from the authors: in telling parents what to expect, this book amounts to a way to check if your child is "normal" without having to question whether or not being normal is a good thing.The best part of the book is the second paragraph. You can read this and then throw the book away, because there isn't anything as helpful as this in the whole rest of the book:For the most part, we have found the boy or girl of this age to be joyous, exuberant, energetic, ridiculous, untrammeled -- ready for anything. What a change he offers as compared to his more difficult, demanding, Three-and-a-half-year-old, just-earlier self! If at times he seems somewhat voluble, boastful, and bossy, it is because it is so exciting for him to enter the fresh fields of self-expression that open up at this wonderful age.So sweet! This made me want to gather up my daughter and give her a big hug, and I keep it in mind when she seems to have too much energy for me. There's a lot to love about someone who has so much enthusiasm, and who will always say "Yes" to any suggestion you have for something to do together.The worst part of the book is this horrific letter included in Chapter Nine: Stories from Real Life:Dear Doctors: I have read your writings for several years and marvel at your solutions for people who seem to need them. I hope you can do the same for me. I have what I think is a problem with my Four-and-a-half-year-old daughter Martha. It just started recently. When she goes to sleep at night she has to have her head covered up, no matter what the weather. If she sleeps with someone else, or takes her nap in the daytime, she doesn't cover her head. Just at night if she is alone. I have talked with her, warned her that she may smother, even spanked her, but it does no good. She waits until she thinks everyone is asleep and then covers her head. I've asked her if she is afraid of something, but she says no. Is this just a stage? If not, how can I stop her?She SPANKED her four-year-old daughter for putting her blankets over her head at night?!? I forgot how terrible the 70s were. This book may have been helpful when it was originally published, but there are better resources for parents out there now.